April 18, 2018 By Allyson 30 Comments This post may contain affiliate links. Read my disclosure policy. When the weather starts getting warmer, I start thinking about corn on the cob! 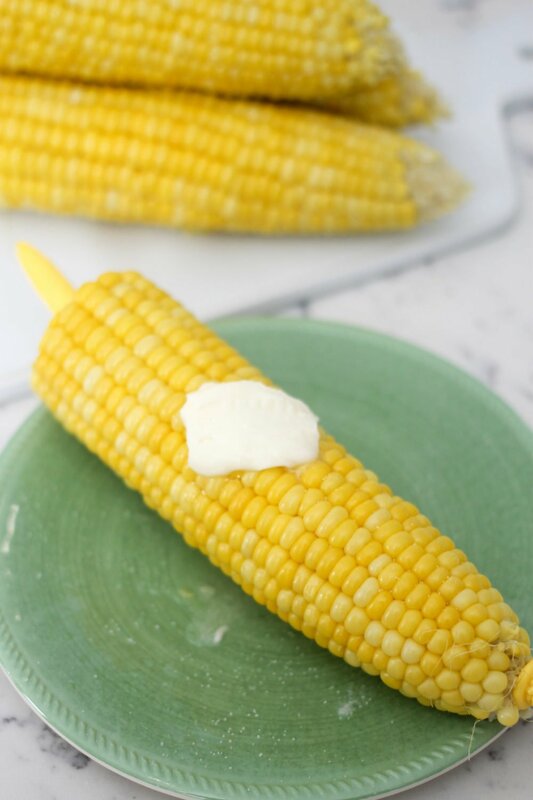 I LOVE having tender, butter, and salt soaked corn on the cob on hot summer days. Now that I have an Instant Pot, I can make corn on the cob in only a few minutes! It comes out perfect every time, and I can easily peel the husk off without any mess, it’s awesome! Snap off the bottom/stem of the corn as short as possible. Trim the top of the husk down to about 1/2 inch from the tip of the corn. 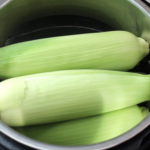 Using a 6qt or 8qt Instant Pot, add water to the bottom (about a cup), add the trivet/steamer rack to the bottom of the pot, then layer the corn IN THE HUSK into the pot. In my 6qt. Instant Pot, I usually put 3 ears of corn on the bottom, then 2 more on top. You may be able to fit more if you have an 8qt pot. Close the top, set Instant Pot to manual for 3 minutes, press start. The Instant Pot will ‘come to pressure’ in a few minutes, then you will see the timer start to count down. Once the timer goes off, quick release the pressure valve (careful, steam will be coming out of the top). Once the pressure is released, you can carefully remove the top of the instant pot. Remove the ears of corn carefully and set aside. Once the corn on the cob is slightly cooled, cut the end off the corn (through the husk), about 1/2 inch above the stem. Using your fingers, press from the top of the husk (small end), and the corn will start to slide out of the husk (see video a bit further down). It will slide out without any silk attached, and it makes cleanup super easy! Instant Pot Corn on the cob should stay good in the fridge for up to 5 days after cooking, but I doubt it will last that long! The simple way: corn, butter, and salt is the classic combination for corn on the cob. This combo lets the flavors of the corn shine through, and everyone seems to like it this way! 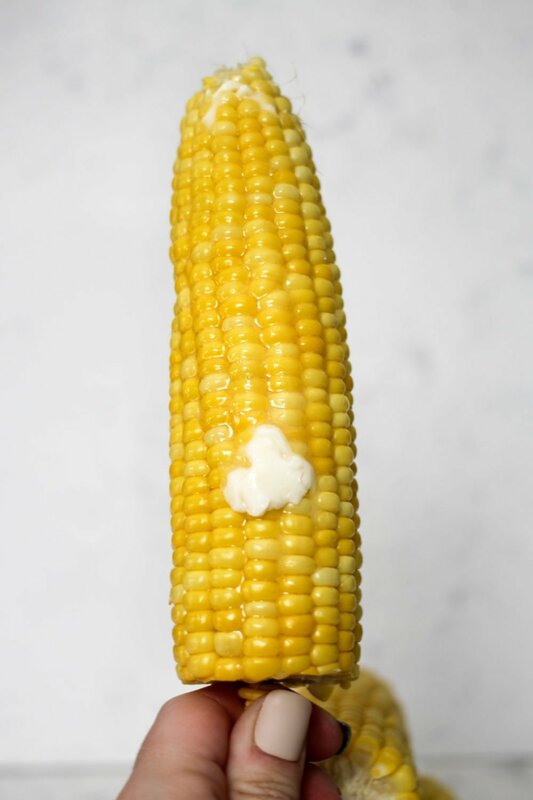 Mexican Corn on the Cob: Roll the ears of corn in melted butter, then spread evenly with mayonnaise. Sprinkle with cotija cheese and serve with a lime wedge. Can also add some chili or cayenne powder if you like it spicy! Sweet Corn on the Cob: Sprinkle cinnamon sugar over the corn on the cob for a decadent corn dessert! Guacamole Corn: whip up some homemade guacamole and slather it all over your corn! However you decide to eat your Instant Pot Corn on the Cob, one thing is true, it will be super flavorful, perfectly cooked, and majorly delicious! Is corn on the cob healthy? Yes! Corn has tons of essential nutrients-corn is a rich source of vitamin A, B, E and many minerals! Studies also show that the aleurone and germ, both present in corn, can help prevent atherosclerosis by reducing LDL (bad) cholesterol while not affecting HDL (good) cholesterol. Corn also contains vitamin C and B6, as well as potassium and magnesium, which prevent heart disease! A small ear of corn only has 77 calories and 3 grams of sugar. Its high fiber content aids in digestion. The antioxidants present in it also act as anti-carcinogenic agents and prevent Alzheimer’s disease. Hawaiian Black Bean Burgers are always popular during the summer! BBQ sauce, pineapple, and spicy savory combine for the perfect burger! Jalapeno Popper Stuffed Burgers are spicy and delicious! Everyone will LOVE these! Peach Honey BBQ Ribs are tender, juicy, and packed with flavor. They are easy to make so fire up the grill and get ready for some fall-off-the-bone ribs! Prep the corn: Snap off the bottom/stem of the corn as short as possible. Trim the top of the husk down to about 1/2 inch from the tip of the corn. Using a 6qt or 8qt instant pot, add 1 cup of water to the bottom, then place the trivet/steamer rack in the bottom. Layer corn ears IN HUSK in the pot. In my 6qt. Instant Pot, I usually put 3 ears on the bottom, then 2 more on top. You may be able to fit more if you have an 8qt pot. Close the top, make sure valve in sealed, set instant pot to manual for 3 minutes, press start. When time is up, quick release pressure valve (careful, steam will be coming out of the top). Once the pressure is released, you can carefully remove the top of the instant pot away from you. Remove the ears carefully and set aside. Using your fingers, press firmly from the top of the husk (small end), and the corn will start to slide out of the husk (see video above). It will slide out without any silk attached, and it makes cleanup super easy! Serve corn with your favorite toppings! I like melted butter and salt - YUM! I am still getting comfortable with my IP but my boys love corn on the cobb and this looks to easy! I’ve got to try this! It should start automatically after you select the time! I was confused because in the video they said to press start button but now I realize they meant steam button! No, you don’t select steam. You should cook the corn on HIGH or MANUAL for 3 minutes. The time will start counting down after you select the time. You don’t press anything else! This is genius! Perfect for summer too. Have got to try this! So easy and such a great Summer side to include in dinners! I am falling more and more in love with my Instant Pot! Can’t wait to use it for corn! This corn looks amazing! I need an Instant Pot! If you don’t need more than a couple of ears, you can microwave corn (leave the husk on) for four minutes on high for each ear of corn. Perfect every time. That is true! You can also do a few in the Instant Pot as well! You might have made corn that much better! I have to try this out! This is my favorite way to cook corn on the cob too! So fast and so delicious! I don’t have an Instant Pot, I do have a Pressure Cooker Crock pot. Any recipe for Corn on the Cob for a pressure crock pot? The peeling pack is amazing! Anything that makes things easier is always great. Yes! Makes life so easy!! Worked like a charm! The corn was yummy and the de-husking super-easy once the corn cooled a little. Thank you! So glad you loved it as much as we do! Makes life SO easy! So happy to see this. I usually cook my corns unhusked in the microwave or oven. Unfortunately my microwave died yesterday afternoon, and I have a bunch of cobs and company coming this afternoon. Thank you for your timley post as now I know I can keep them in the husks and not heat up the kitchen on this very hot day! YES!!!! Wow so glad you found it and it worked out! Sorry your microwave broke, but I assure you this way is BEST! Happy 4th! I tried this last night and our corn was tough. I cooked 4 ears on the trivet with 1 cup of water on the manual setting high for 3 minutes and did a quick release. Any suggestions to fix this would be appreciated! If you found the corn was not tender enough for your liking, I would just add one more minute when cooking! I love my 2 IP’s. I have a 3qt & an 8 qt. I don’t know how I managed without them. I usually steam mine for 1 minute sand then rest for 1. Is what I’ve found works best fur my taste. Being in husk, does it take longer to cook? Honestly I prefer in husk when I cook them on the grill or micro. It does take a bit longer in the husk to cook, but I am shocked to hear 1 min without has I have had A LOT of people tell me they cook the corn for 3 minutes in the IP without the husk! I guess it depends on your taste buds and how crunchy you like it! 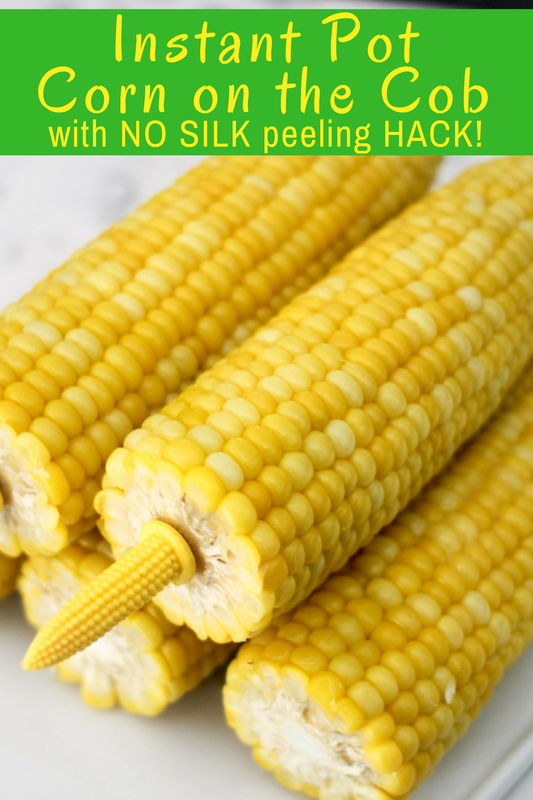 I always freeze my corn on the cob with the husk & silk. Normally I usually boil it or microwave it just like that, straight from the freezer. I was wondering if I could use the frozen ears in the instapot or pressure cooker? I haven’t tried with frozen corn, but I am sure it can be done. I would try adding 1-2 more minutes to the cooking time. Please let me know how it goes! I have tried it from frozen before and it has worked just like a charm! I don’t remember the exact cooking times (hence why i went looking again lol) but i know i added a few minutes to it. We had rstger large homegrown crops so i think with like 7 or 8 ears i did about 10 minutes or so? Im going to try it again tonight and sesee what 10 minutes gets me. If i remember i will post what time i actually used.